Dr. Kristin Gendron and Dr. Garrett Griffin of Midwest Ear Nose and Throat and Midwest Facial Plastic Surgery, respectively, have joined forces to improve outcomes for patients with benign and malignant tumors of the parotid gland. The parotid gland is the largest salivary gland, located in front of the ear. It is about the size of a hamburger. Even smaller tumors often require removal of much of the parotid gland, creating a relatively large defect or “divot” in the face. Traditionally, parotid gland tumors were removed through an incision that extended low into the neck creating an unsightly scar in addition to the contour deformity. Drs. Gendron and Griffin have modernized parotid tumor surgery in 2 major ways. First, they remove the tumor through a facelift incision to create an invisible scar. Secondly, after tumor removal Dr. Griffin reconstructs the area to achieve near-perfect facial symmetry. Dr. Griffin is able to restore normal facial shape and contour by moving nearby muscle into the area where the tumor was removed. He also usually performs a mini-facelift to make sure the skin lies perfectly flat, which also improves the patient’s overall appearance. 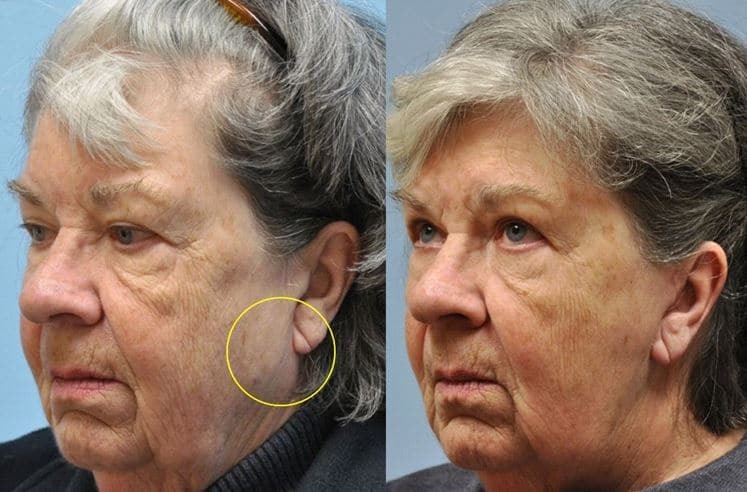 For patients considering a facelift at some point in their lives, Dr. Griffin can perform a facelift on the normal side during the same surgery. This woman had a tumor in her salivary gland just under the ear (circled) that was removed by Dr. Gendron. After reconstruction, there is no visible scarring or abnormality in facial shape. Dr. Kristin Gendron is a fellowship-trained head and neck oncologist who specializes in treating tumors of the face, mouth, and throat. Dr. Garrett Griffin is a fellowship trained facial plastic surgeon who specializes in cosmetic and reconstructive surgery of the face. They have offices in Woodbury, Maplewood, St. Paul and Eagan.